Professor Sir Mansel Aylward CB is the Director of the Centre for Psychosocial and Disability Research at Cardiff University. This offers a unique opportunity to extend knowledge and understanding of the psychosocial, economic and cultural factors that influence health, illness, recovery, rehabilitation and reintegration. He is also first-ever Chair of Public Health Wales – a new unified NHS Trust responsible for the delivery of public health services at national, local and community level in Wales. He was Chair of the Wales Centre for Health, an Assembly Government Sponsored Body established to be the ‘hub of connected organisations’ and to communicate better health messages to the people of Wales. Professor Sir Mansel Aylward CB was knighted in the Queen’s New Years Honours 2010 for services to health and healthcare. In October 2008, during the 60th year of the NHS, the First Minister asked Professor Sir Mansel Aylward to chair the Bevan Commission. This brings together a group of international experts to give expert advice to the Minster for Health and Social Services to help ensure that increasingly Wales can draw on best practice from across the world while remaining true to the principles of the NHS as established by Anuerin Bevan. In October 2007 Professor Mansel Aylward in his capacity as Chair of the Wales Centre for Health was asked by Edwina Hart, Minister for Health and Social Services to undertake a review of Health Commission Wales’ functions, including its decision-making processes and appeals mechanism. Under this arrangement, a report on key findings and advice (including the making of recommendations) was provided to the Minister in June 2008. Professor Mansel Aylward was also asked to advise the Minister healthcare provision in Merthyr Tydfil and surrounding areas, which was provided to the Minister in July 2008. In 2005 he was elected to the new Queen’s Birthday Honours Committee, designed to make the system more transparent. In September 2008 he was formally re-appointed for a further 3 years. From 1996 to April 2005 he was Chief Medical Adviser, Medical Director and Chief Scientist to the UK’s Department for Work and Pensions. He was also Chief Medical Adviser and Head of Profession at the Veterans’ Agency, Ministry of Defence. From 2001 – 2009 he was The Royal Society of Medicine’s Academic Sub Dean for Wales. He is a physician and specialist in rheumatology and rehabilitation, therapeutics and clinical pharmacology; a visiting Professor at several universities in Europe and North America and a consultant to the United States Social Security Administration and Department of Labour. He entered the British Civil Service in 1985 and was appointed Chief Medical Adviser at the Department of Social Security in 1996 and at the Department for Work and Pensions in 2000. From 1974 to 1984 he was Chairman and Managing Director of Simbec Research Ltd, UK, and President of Simbec Inc, New Jersey USA. He played a key role in development and evaluation of the UK’s medical assessment for incapacity (the All Work Test), and was heavily involved in developing the Personal Capability Assessment (PCA). He led the Corporate Medical Group on the UK Government’s Welfare Reform initiatives and made a major contribution in establishing the new postgraduate diploma for doctors in Disability Assessment Medicine. 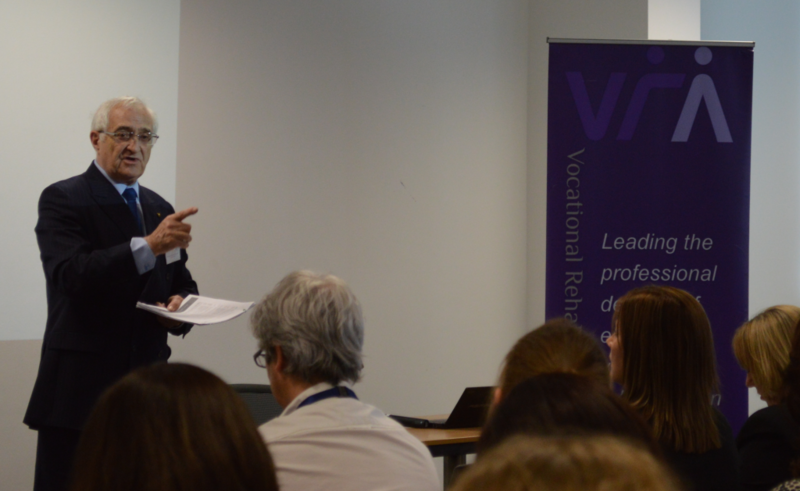 He was closely involved in developing the UK’s successful “Pathways to Work” initiatives and a framework for Vocational Rehabilitation. He is keenly interested in addressing the health, work and social issues relevant to morbidity, mortality, work, economic inactivity and social exclusion in the South Wales Valleys where he was born and brought up. His interests are in rheumatology and rehabilitation, health and productivity, psychosocial illnesses, health inequalities, chronic fatigue syndromes and back pain disability. He has published widely in these various areas.